I do engraving with a home built machine. This lets me make lines of about .018 width on flat surfaces. Text of .14 height has good legibility, if the font is simple. I use the design software “Cut2D” by Vectric. 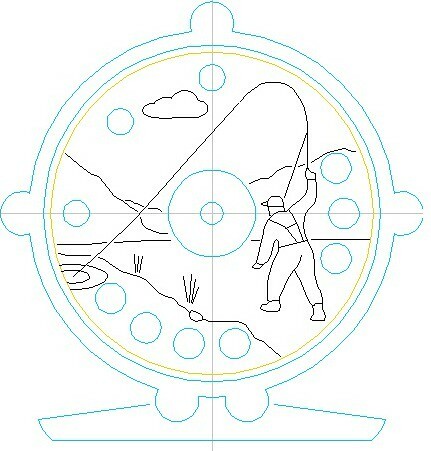 Here is the design for the back of a typical 5 weight reel. 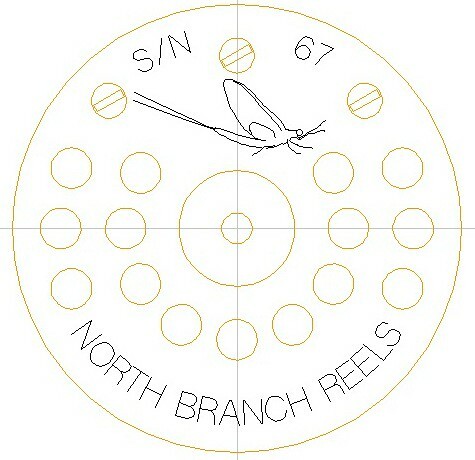 The “S/N 67” is the reel serial number and is there mostly for my benefit (future identification). I can hide this on the inside of the reel if you would prefer. 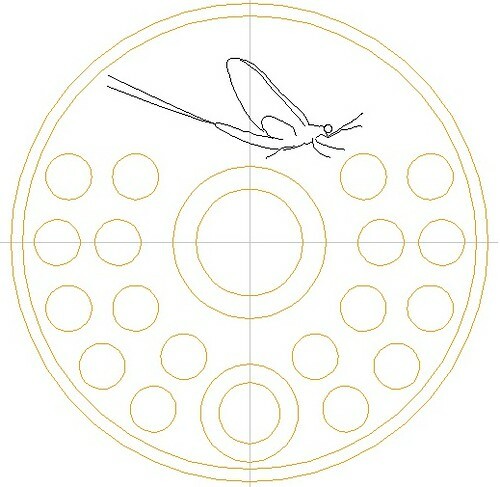 The mayfly is a typical line sketch from my repertory. 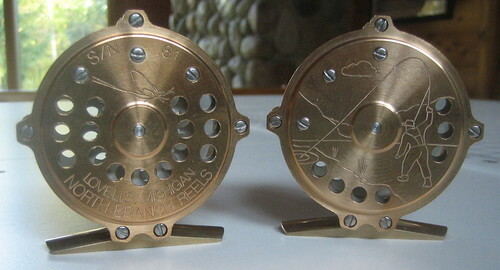 On a reel with a blank (unengraved) back, the area here occupied by “North Branch Reels” would instead have additional porting holes. 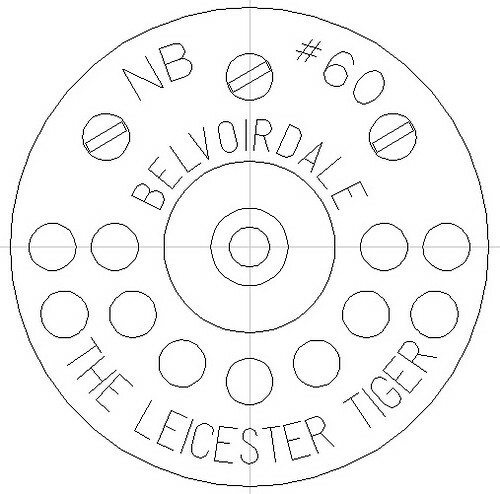 This is an engraved back for a 3 weight reel. “NB” stands for North Branch and “#60” is the serial number. I believe that the Leicester Tigers are a soccer (football) team. Here are 2 more reel backs for which I have made line sketches. In both cases I have removed much of the porting in order to make room for the engraved design. 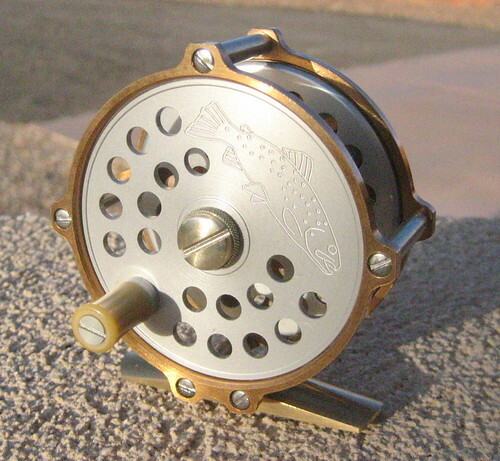 Here is a 5 weight spool face with an engraved trout. For a blank (unengraved) spool face, I would normally not fill in the space with porting. This extra material provides a “counterweight” for the knob. 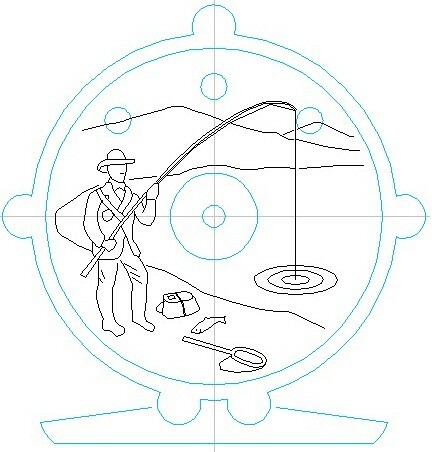 If you have some picture that you to have engraved, I will be glad to quote for the design time. I am not set up for 3D, only simple 2D line work. 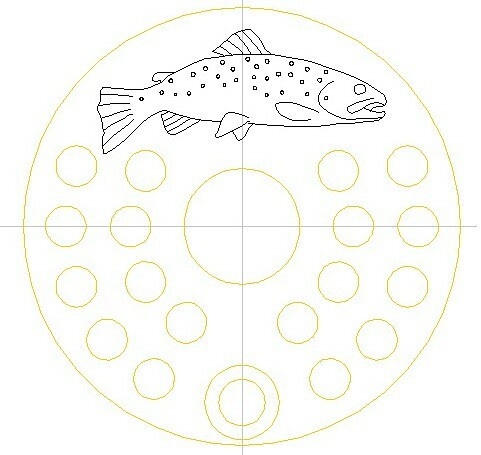 Here is a 3 weight spool face with the same mayfly earlier shown on a reel back. And here is a caddis fly that I have not yet used. The design software makes it easy to distort text to create monograms.